Crews painted giant "BUS ONLY" letters on the city’s bus lane Wednesday in the hopes it will make it easier for drivers to see. The bus-only lane, which went into effect Nov. 5 along Downtown’s Main Street corridor, has helped increase traffic efficiency by 20 percent, according to Councilmember P.G. Sittenfeld and Southwest Ohio Regional Transit Authority officials. 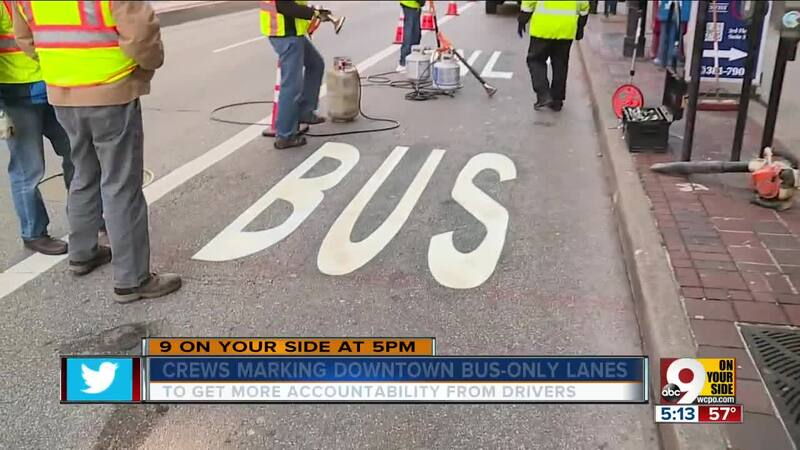 CINCINNATI -- Crews painted giant "BUS ONLY" letters on the city’s bus lane Wednesday in the hopes it will make it easier for drivers to see. The bus-only lane, which went into effect Nov. 5 along Downtown’s Main Street corridor, has helped increase traffic efficiency by 20 percent, according to Councilmember P.G. Sittenfeld and Southwest Ohio Regional Transit Authority officials. Riders have asked for more enforcement since the lane opened, and officials hope eight “bus only” markings will help remind drivers. The bus-only lane reserves the right side of Main Street for bus traffic between Government Square at Fifth Street and the Hamilton County Courthouse at Central Parkway. The lane becomes bus-only during the morning and evening rush hours, from 7-9 a.m. and 4-6 p.m. Throughout the rest of the day, the lane offers metered parking spaces. Traffic Unit Commander Lt. Brian Norris said the city's Parking Enforcement office -- with assistance from CPD's Central Business Section -- is in charge of enforcing the new rule.